Add in a saucepan the rice, sugar, vinegar, a pinch of salt and the water. Boil for 15 minutes until the rice is cooked. Cut the salmon into small pieces, and slice the prawns in half lengthways. Then cut thin slices of avocado and cucumber. Cut the top and bottoms of the plastic bottles to give you 2 plastic circle molds. Cut long strips from the seaweed sheet 1.5cm wide. Place 2 seaweed strips end to end, and add the plastic circle mold over the top. 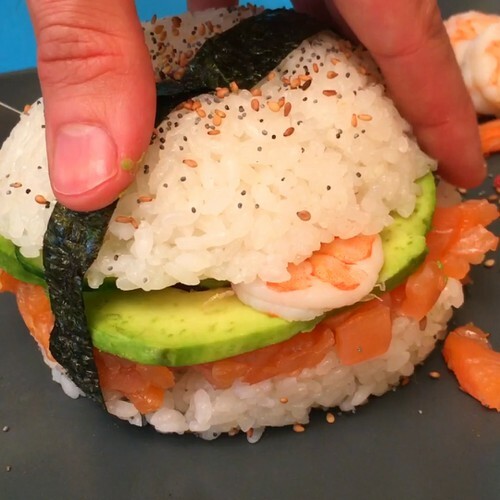 Add the cooked rice inside to give the base of the burger, then add a layer of chopped salmon, then avocado, then prawn, then cucumber. Remove the plastic mold, and use a small bowl to shape the top of the burger bun from the remaining cooked rice. Add the rice top then fold the seaweed strips over the top to hold it together. Serve with sesame seeds and soy sauce.